The Exo Series BT cable is a new versatile detachable Bluetooth enabled cable release from PlusSound Audio starting at $149. This is the second time Headfonics has officially worked with Plussound with the first being a review of their well-received Cloud 9 portable amp way back in January 2015 from Smit Patel. For those that are new to Plussound, they hail from the US, (LA to be precise), and were established in 2012. Their core business is cable manufacturing and cables for all types of audio products including IC’s, headphones and IEMs. They have expanded since then to include a portable amp, some recently launched IEMs as well as collaborate with some well-known names such as Audeze and Unique Melody. In short, people like them and what they do and are one of the better-known cables companies out there for audiophiles. It has been a while since the Cloud 9 review so I am glad Christian and his team have come back to us and this time its more on their core business of cables. Only this time with a modern twist in keeping with their more lateral thinking of late. The Exo Series BT cable is a marriage of Plussound expertise in aftermarket cable making with the fast-growing Bluetooth market, no doubt spurred by the ditching of jacks in products such as the Apple iPhone. The cable allows you to experience a range of cable types that are pitched as being superior to many stocks cables your IEM or headphones comes with without having to “jack up”. Unlike some BT products, the Exo series is not stuck at the end of an existing driver. 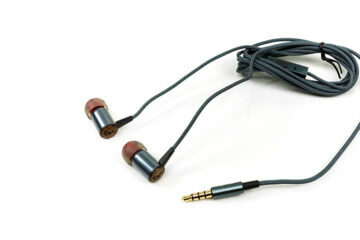 This is a detachable cable designed to fit onto any IEM you currently have that is also detachable. This makes it a very flexible solution for those looking to go both aftermarket in terms of cable upgrade as well as for those whom wireless is an important choice. The Bluetooth module is aptX compatible which is one of the 3 big choices out there on the market today. The other two is aptX-HD which I would have loved to have seen simply because of its higher decoding and transmission rate and LDAC from Sony. Of the three aptX has the highest saturation in audio products today though aptX HD is available on some AK DAPs and possibly a lot of future smartphones. The Exo Series has 5 different types of cables. They differ in terms of finish and number of wires used with the entry level 4-wire copper standard finish starting at $149. You can also purchase sleeved versions in red and black primarily for headphones as well as upgraded 6 and 8 wire versions from $249.99 and $299.99 respectively. The one we have is the 6-wire which is the mid-range version of this cable and is called the 6 series range. Though the X6 Series BT cable starts at $224.99 you do in fact get up to 6 options for the wiring and each has its own corresponding price point. The stock length for their wireless cables is 2 feet with options to lengthen at $25 per foot before check-out. All options are made from UP-OCC Type 6 Litz cable wiring with the entry-level copper type 6 costing $149 up to the gold-plated silver type 6 Litz at a more eye-watering $824.99. The exact model we are reviewing is the silver-plated copper Type 6 Litz version which retails for $274.99. All Type 6 cables used by Plussound for the Exo Series is rated at 26AWG. I have a fondness for this gauge of wire, especially when the jacket is not overly burdensome. Generally speaking, you get a nice level of pliancy and it is not too thick or stiff. 26Awg is a fairly light strand composition in terms of threading size with an approximate 0.405mm diameter and 62.7 turns of wire. To give you another point of comparison, Whiplash Audio’s Twag v4 is a 22.5AWG UPOCC custom silver Litz design and measures a little fatter and stiffer at approximately 0.6mm in thickness and around 16 turns of wire per cm. Resistance will be lower on the Twag versus the thinner 26awg build on the Exo Series but at less than a meter it should not be a huge factor in the final sound production. Each cable has seven dampening cores for vibration reduction and improved or at least consistent conductivity form the strand groupings. Those worried about the dreaded green effect from oxidization can also rest at ease as Plussound has enamel coated the strands to prevent it from turning into the Incredible Hulk. The final material treatment is a cryogenic process for each cable to strengthen each cables structure and make the whole internal design just that bit more robust from daily wear and tear. There are no less than 18 different types of connectors for the X6 BT cable ranging from your standard 2-pin 0.78mm to Fitear, Sony, Hifiman Sennheiser and Audeze (LCD range) to name but a few. I am pretty much sure no matter what you have Plussound have a connection for it. You also have 6 different colored heat shrink connectors. The left color does not have to match the right. There are two different colors, black and silver, for the slider. 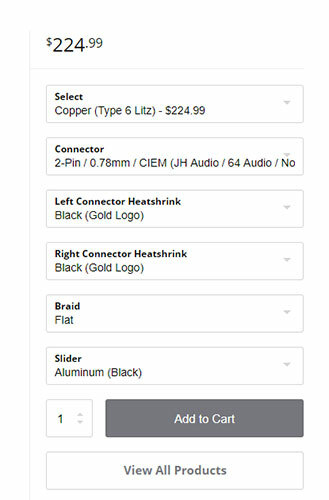 Regardless of your connector, heat shrink or slider choice there is no additional charge. The Bluetooth module is reasonably burly in comparison to the fairly short cable that runs through it. It is constructed from a black stiffened plastic with what looks to be a rubberized coating. To the side, you have a single micro-USB charging port and to the top, you have 3 well separated and slightly raised functionality buttons. 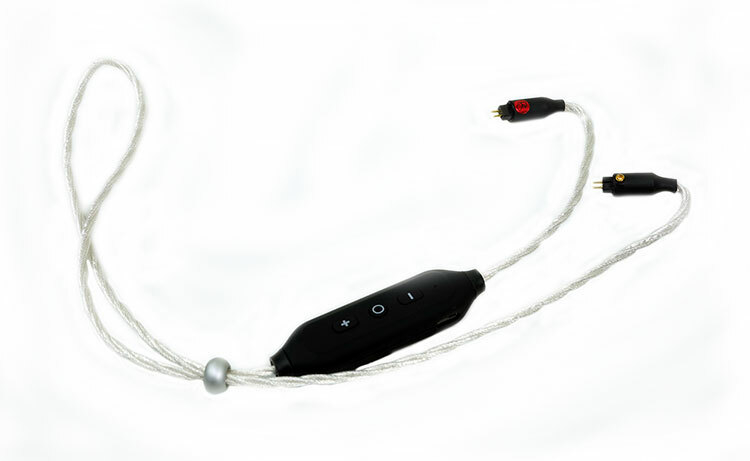 The physical proximity to the connectors might be better suited to headphones which have a degree of separation between cheek and connector. 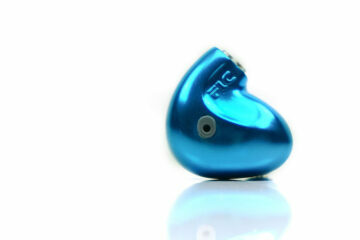 For IEMs though the module is going to sit fairly tight to the back of your ear. You will not be able to see anything when in use so you will just have to trust your hands when operating blind. The slight rise in the physical buttons on the top plate of the module do help a lot in blind operation. Being both easy to find and far enough apart not to confuse them. There is plenty of functionality in this module. Not only is it configured for a balanced output but it is also aptX capable and will also handle AAC and SBC. The X6 BT module also uses BT 4.2 which is should result in a faster transmission rate, less potential lag and longer battery life than older 4.1 receivers. The module also comes with a built-in mic should be using it with a smartphone and has a rated distance of 40 feet unhindered with over 10 hours of rated battery life. One cool thing to note on some smartphones it will display a small vertical bar to denote the BT module battery life. My LG G6 picked it up right away and is something I think is incredibly useful. The Exo Cable series has a downloadable quick BT module guide which customers receive when along with their e-receipt. It is perhaps the most likely area of confusion when getting started so it is useful to know one is available. Some controls are indeed self-explanatory such as the buttons for volume control. The power button does have dual functionality though, the most important of which is pairing. Note pressing and holding for a period of time will get you a flashing red light that some might think is an active pairing signal. This is a false alarm, you need to hold it a little longer until you get a flashing blue/purple light. Your source should then be able to detect and pair with the module. Pressing and holding for a few seconds will power down the module. You do not need to repair, its a one time job. If you turn it on and the source is on it will prompt for pairing and you are good to go. Aside from the basics, you can learn a bit more from the manual on how to pair up to 2 devices with the cable which is pretty cool actually for comparing DAP performance with the cable. I had some concerns when I received the final product on just how easy it would be to use it and how best to wear it given the rather short stock length. The best solution is to wear the X6 BT cable around the back of your head as opposed to the front. Note the following comments are based on the stock config received, however, you can request the BT module to be positioned anywhere on the cable to suit your needs as well as having a shorter or longer cable length. In the stock config and wearing it front facing the BT module will sit somewhere on your neck just behind your jawline though. For me, the comfort level wasn’t too bad actually and much better than I thought it would be using a CIEM (VE8). The lack of memory wire does not hinder the positioning too much, especially with CIEMs. Even with universals, it has a natural springy curve that works well in keeping things in place during use. However, rapid side to side movement of the head or jaw chewing will result in the BT module bumping a little on your neck and it may distract. Wearing it behind your head was a much comfier experience with the BT module well out of the way. This is fine for music listening only and playback control. You cannot see the module front or back as it does not dangle. However, I do think you should wear it front facing if you intend to use the mic for phone calls. Behind the ear will degrade the reception with hair and ear blocking the mic a bit more. Some pros and cons of the packaging. First, it is a little simplistic but a professionally done plain black box with a lift lid. On the top, it has a subtle Plussound logo and strapline. To the side, it has the all-important “Handcrafted in the USA” moniker. On the inside, you have a single foam layer at the bottom and the cable itself in a sealed plastic bag alongside a set of rubber straps with the Plussound logo. 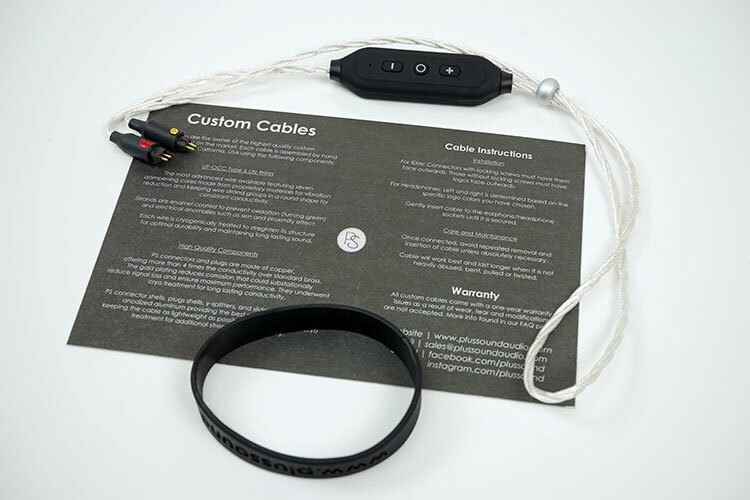 You also get a single quick guide card explaining the cable materials and finish as well as how to look after them and how to install them on your desired IEMs.